The USB 2.0 wireless card supporting dual-band 802.11a/b/g (2.4GHz & 5GHz) radio operation. It provides high-speed wireless connection with data rate up to 108Mbps. NUB-862 has high power and high sensitivity. It can advance your distance and performance. 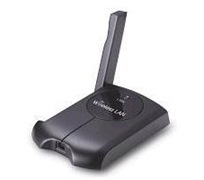 To protect your wireless connectivity, the high-speed wireless USB adapter can encrypt all wireless transmissions through 64/128/152-bit WEP data encryption and also supports WPA. Dynamic Frequency Selection (DFS) puts your network on the cleanest channel in your location. With the High-Speed Wireless USB Adapter, you will experience the best wireless connectivity available.